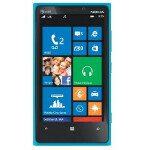 Looking for a great price on the Nokia Lumia 920? Amazon will sell you the phone in Cyan, Yellow, Red, White or Black for just $69.99. which is $30 off the price at AT&T where it is available exclusively in the U.S. The Nokia Lumia 920 has been selling well, well enough to be considered the gold standard for new phone sales overseas. For example, when the BlackBerry Z10 was recently launched in the U.K., analysts were saying that the new BlackBerry 10 model got off to a faster start than the Nokia Lumia 920. While no expiration date is listed, we're sure that this deal will not go on indefinitely. 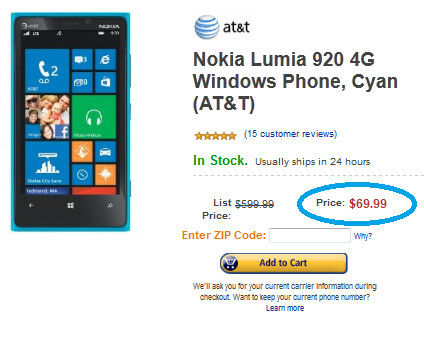 In other words, if you've been looking to buy the Nokia Lumia 920, this might be as good as it gets. Unlike some of Amazon's special deals, you do not have to be a new AT&T customer or add a new line to get the special pricing. Amazon is also throwing in free two day shipping. And when you get your Nokia Lumia 920, you know it won't have a kickstand. But that is a great reason to watch the video below from Nokia Russia, showing all of the different things that you could use to prop up the phone to get the best viewing angle. Check out the video below to see if it inspires you to come up with a kickstand for your Nokia Lumia 920. And when you come up with something that works, don't keep it to yourself, huh. In Soviet Russia you don't stand phone, Phone stands you! I believe you meant to call it a Lumia, and not a Limia. Would you get in trouble for a misspell? Meanwhile here in the Philippines we still don't have nokia wp8 devices. this is BS!